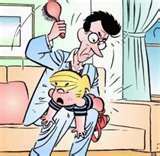 When I discuss spanking, I am not referring to punishment. One or two light slaps on the “bottom,” light pinches or squeezes, serves the purpose of getting your child’s attention. It is not for punishment. Instead try “time outs,” withdrawal of favors or avoidance. If there are tantrums, and your child could get hurt or hurt others, pick your child up and put him or her in a “time out” spot or place where he or she can’t get hurt. Spanking an adolescent can be counterproductive. Withdrawal of privileges works most of the time and bargaining can produce good end results. Never use belts, sticks or other hard items (like above) which could injure your child. In todays environment parents sometimes are reluctant to control their children for fear of abuse charges, but firm measures are sometimes needed to distract your child and get them on-track to appropriate behavior outside the home.